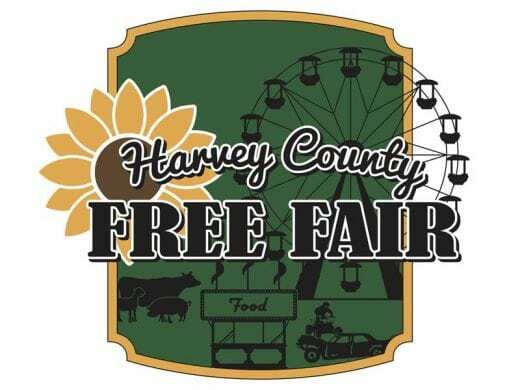 August 2nd – 6th at the Harvey County Fair Grounds, 800 W 1st street. High nighttime temperatures during the reproductive growth (at or after flowering) can reduce kernel number, and if later in the season, kernel weight. This effect can be explained as an increase in the rate of respiration, increasing the demand for sugar for energy and diminishing its availability for supplying the growing kernels. In addition, as experienced in many parts of our state, high night temperatures tend to accelerate plant phenology, running more quickly but with overall lower plant efficiency in using available resources. This situation has been documented in many parts of the state as an earlier-than-usual (close to 2 weeks) flowering time. For example, a corn planted during the first week of May was flowering around the first or second week of July in 2017 (depending on the maturity) and a similar corn hybrid this year was reaching the same stage around the last week of June. The effect of high night temperatures will be exacerbated as corn is entering into the most critical growth period (a few days before flowering to grain filling). The consequence of high night temperatures will be reflected in reductions in kernel number (if timing of the stress was around flowering) and/or kernel weight (if timing of stress was coincided with the grain filling period). In summary, high night temperatures will be impacting corn yields, but the final yield reduction is yet to be determined, clearly depending on the timing of the stress (duration) and the area of the state affected. We have exciting news about our fair this year! First off our schedule has changed. We have moved up our dates by one day, making all building exhibits judged on Friday August 3rd. Thursday August 2nd from 7-9 pm and Friday August 3rd from 8 -10 am. Judging will take place on Friday August 3rd starting at 11 am. 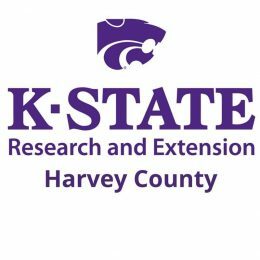 You can find the full schedule on our website www.harvey.ksu.edu. While scouting your corn fields after these rains are sure to be on the lookout for leaf diseases. If you don’t catch the diseases in time in can hurt your yields dramatically. These are some of the common corn leaf diseases to be watching for. It is typically less serious in Kansas than the other leaf diseases. Symptoms are small, round to elongated pustules that start out golden brown then turn darker later in the season. 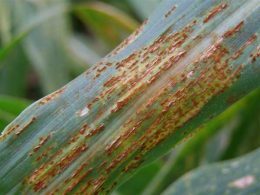 Common rust pustules commonly form on both sides of the leaf and are sparser than those of southern rust. This disease can occur wherever corn is grown. Infection is favored by moderate temperatures (60 to 77 degrees) and high relative humidity (greater than 95 percent for at least six hours).